Combine all ingredients, form into balls, bake at 400 degrees for 20 minutes (until golden and cooked through). Heat extra-virgin olive oil in a pan over medium-low heat. Add minced onion, cook, stirring, until soft, about 10 minutes. Add garlic and cook, stirring, for 2 minutes. Add red pepper flakes; cook for 1 minute more. Increase heat to medium, add puréed tomatoes and season lightly with salt; cook, stirring occasionally, until sauce reduces slightly about 20 minutes. Remove pan from heat, stir in basil sprigs, and set aside. Meanwhile, bring water to a boil. Season with salt; add spaghetti and cook until aldente. 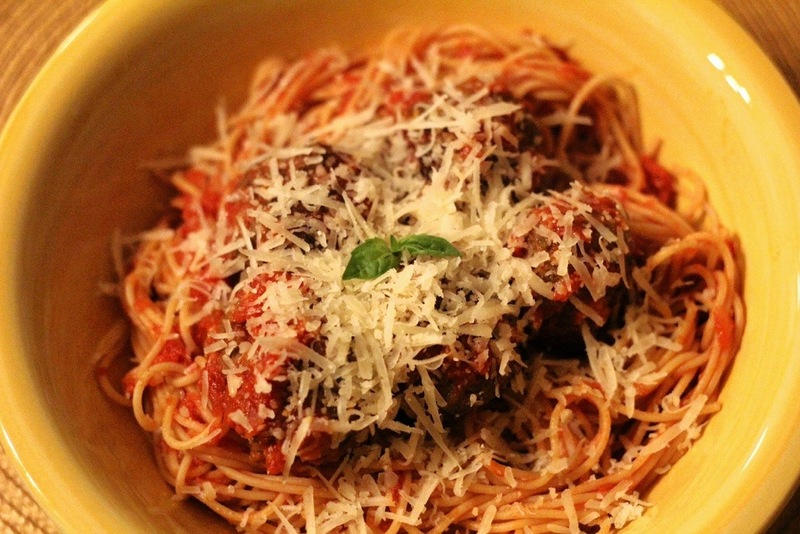 Discard basil and heat sauce over low – medium heat; add meatballs and pasta, toss to coat. Remove pan from heat; add butter and cheese; toss until cheese melts. Transfer to warm bowls; serve with more cheese, if desired (to which I say: YES! ).